Maui hiking trails make for fun ways to explore the island. Planning a vacation on Maui usually implies surfing, snorkeling or simply enjoying a few days under the Hawaiian sun. But did you know you can plan to explore some of Maui's hiking trails and live an adventure you're not going to forget? The beach is a wonderful place to experience a rush of adrenaline! But Maui hiking trails make for amazing alternatives for nature lovers to have a great time. If you thought hiking trips on Maui would be boring, take a look at the tips below. Learn what fun activities you can enjoy while exploring Maui hiking trails and plan the perfect trip both you and your friends will definitely enjoy! Are you a fan of taking beautiful pictures while nature poses for your perfect shot? Luckily, Maui hiking trails and photography go hand in hand! Consult with an experienced hiking guide and see what's the best Maui hiking trail you can explore and take amazing pictures while you're at it. You can spend you day admiring nature and polishing your photography skills as you explore the island. Make sure you pack enough supplies to last for your entire trip and leave some room in your backpack to carry along your reflex camera. Maui hiking trails often lead to a beautiful waterfall. If you book a waterfall tour with a guide, make sure to pack along your swimming gear! Waterfalls make for amazing ways to cool down after a long walk on one of Maui's hiking trails. You can relax in nature's natural swimming pools, while admiring the beautiful surroundings! Make sure swimming is allowed before you embark on your Maui adventure though. Consult with your guide before booking a tour and ask is swimming is something you can look forward to. What else can you do on a hiking trip, besides taking pictures or swim under a waterfall? Packing enough food and water to last for an entire hiking trip is always recommended. 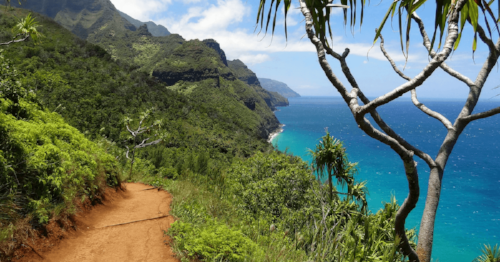 So why not make a pit stop somewhere along the way and enjoy a nice picnic before you go out and about exploring the rest of you Maui hiking trail? As long as you respect nature and don't leave anything behind, you can safely enjoy a meal with your friends as you sit back and admire the beautiful surroundings. If none of the activities above are something you might look forward to, don't worry. Most nature lovers are having a blast just sitting down and enjoying the quiet! All Maui hiking trails are amazing places to explore on a beautiful day. And taking the time to sit back and relax makes for the perfect way to recharge while you're on vacation.